A Unique 3-Piece Bundle at an Incredible Value! This utility army knife is 2.5" in length and 1.2" in diameter. It weighs 0.5 lb., which makes it easy and convenient to carry around. All of these durable, strong tools fold neatly away. Have a utility tool right at your fingertips. It's the perfect size to sit flat in your wallet (3.3"x2.1"x0.04"). With the other items, it makes for the perfect portable tool set. This bright, zoomable, multi-purpose LED flashlight is just 7.3" in length and 1.2" (head)/0.8" (body) in diameter. It weighs 4.6 oz and can be recharged 10,000 times during its lifetime, making this flashlight perfect for on-the-go. LEDs are energy efficient and consume very low power, which means it stays charged longer than your average flashlight. The total kit is 4.75" L x 8.25" W x 2.25" H, weighing 1.5 lbs. Take these tools camping, backpacking, or hunting. Leave them in your car for emergencies, or keep in your workbench for instant problem solving in any situation. This high-quality, affordable bundle is made of sharp stainless steel to eliminate rust and increase longevity, ensuring you are ready for any issue that comes your way. 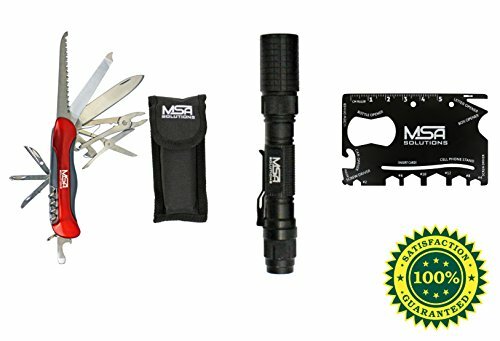 These tools make for a great gift for the avid camper, family or friends. HEAVY DUTY MULTITOOL: 1 big knife and 3 smaller knives, saw, file, curved pliers, scissors, can opener, wine opener. Great for outdoor activities, like camping or hiking, or as a gift. LONG-LIFE LED FLASHLIGHT: Rechargeable and long-lasting, 1000 full charges, high performance 1000 lumen, 10 watts. Keep for emergencies or use for your everyday light source. CREDIT-CARD SIZE UTILITY DEVICE: Flat pocket tool with seven gadgets in one. Ruler, letter and box opener, screw driver, cell phone stand, can opener, and peeler that slips right into your wallet. AMAZING VALUE VERSUS COMPETITION: Save money on buying these products individually with this 3-item kit. Value of one-of-a-kind kit surpasses any similar high-grade items currently on the market. HIGH QUALITY, STRONG TOOLS: Classic tools built with on-the-go functionality. Long-lasting and tough, with everything you need in just three sleek designs.